Home Editor's Picks Goenkas lay a shocking condition for Naira in Yeh Rishta…. Kartik’s Dadi is taking Naira’s test. She keeps a condition for marriage. She asks Naira to leave her name and lose her identity. Dadi asks Naira to take a vow and they will write same name in wedding invitation also. She says Kartik’s wife name will be Sumegha. Naira has to lose her name to marry Kartik. Dadi says its tradition in Goenka family, that Dadi keeps her bahu’s names. Naira does abshagun by entering home before Grahpravesh. Dadi tells this is the solution to solve the abshagun effects. Naira does not vow. She cries and tells Dadi that Akshara and Naitik have named her Naira by joining their names, and she can’t leave her name. Naksh, Naitik and everyone do not agree to Kartik’s Dadi. Naksh says Naira’s name is part of Akshara and Naitik, and this name is her identity. He gets emotional and tells Dadi that they will not change Naira’s name. He asks Dadi to ask every family member how they taught Naira to take her name. He says Naira has memories and identity with this name, its not a small name like others. 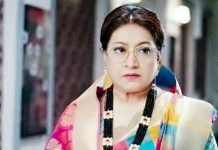 Dadi is adamant to change Naira’s name. Surekha says surname changes after marriage, so what’s the big thing if we change name, mummy ji has changed even our names also. Suwarna and Surekha say how Dadi changed their names too. Kartik comes to support Naira, but his decision shocks everyone. Kartik asks Naira not to go against Dadi. Kartik asks Naira to agree to Dadi’s wish. Naira feels hurt that Kartik did not stand by her this time. Everyone gets shocked with Naira’s strange entry in Goenkas house. Naira does not care that Goenkas are seeing her, and runs to Lav and Kush. Kartik stops her and asks what’s the matter that she had to come this way. Naira tells everyone the reason why she came in hurry. She says I was chatting to Kartik on video call and saw Kush getting locked in the cupboard. She saves Kush and gets him out of the cupboard. Kartik thanks Naira for saving Kush. Naira apologizes to Dadi and says I did not wish to come, I was tensed about Kush, I called everyone, but none answered. Naira takes Dadi’s blessings. They find Naira’s grah pravesh happened before marriage. Naira will be held responsible for abshagun happening in Kartik’s life.